The natural environment plays a critical role in our lives, providing us with the food, water and air essential for life, and the raw materials to fuel our economy. It also provides us with services that pollinate crops, clean water, air and waste, and gives us space for recreation, wellbeing and culture. Despite this, nature’s true value is often overlooked or taken for granted, often leading to environmental pressures, degradation and damage. We believe having access to the right information is an essential step forward in protecting and restoring the natural environment. 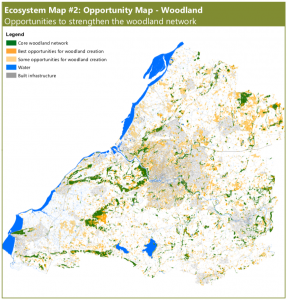 In 2013 WENP began an ambitious project to assess the state of the environment in the West of England. Taking an ecosystem service approach, we developed a series of 14 ecosystem service and ecological network maps. These were created by Environment Systems and adopt ecosystems service modelling using the ‘SENCE’ method (Spatial Evidence for Natural Capital Evaluation). Over 200 datasets were collected and analysed. WENP won the Dame Mary Smieton 2016 Research award for this work. Special thanks to our partners for ongoing support, in particular Avon Wildlife Trust, Wessex Water and Natural England who provided financial support for this project. All data has been licensed for use by the West of England Nature Partnership and cannot be reproduced. The information on the maps is provided for identification purposes only. No warranty as to accuracy is given or implied.